What’s the most popular activity which is starting to lose its power? The main activity for all primary home PC users is sending or receiving email. Households with older versions of Windows are different in their activities from other OS users. Users of older Window OS’s second-most frequent activity is searching the Internet on other issues, instead of for news, like other OS users. Users of older Windows PCs’ sixth activity is searching on health issues. The two largest rank differences for users of older Windows OS’s are in personal/household activities (recipes, home design, etc.) and listening to music CDs or MP3s. Personal activities rank higher (9) for older Windows OS’s than other OS users, especially higher than Vista (21) and Apple (22) users. Users of older Window OS’s frequency of activity for listening to music CDs or MP3 was, at 24, well below Apple users at 9, and 13 for both Vista and XP users. 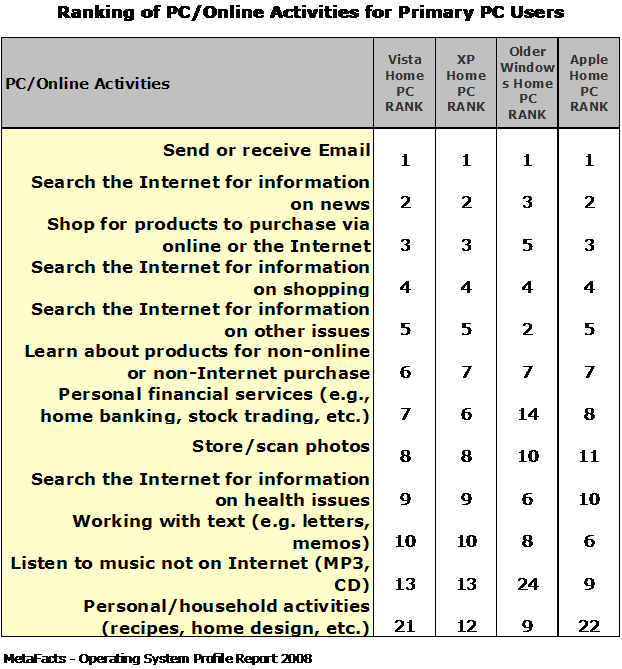 Vista and XP users ranked their highest 10 activities very similarly. There is a difference in the 6th and 7th ranking, but otherwise they share the same order of activities. Apple users are similar to Vista and XP users for the first 5 activities. They begin to differentiate afterwards. Apple users have a higher ranking than Vista and XP users for working with text (6 vs. 10) and listening to music CDs or MP3s (9 vs. 13). Mobile PCs have moved into the majority, with 53% of computer-using adults using either a notebook or tablet PC, according to the Busy Mobiles Report from MetaFacts, Inc. The large-scale nationwide survey found that 44% of the mobile PCs used 40 or more hours per week are owned by households, 31% are owned by businesses with 1,000 or more employees, and 25% by small & medium businesses, education, and government. The survey also revealed that the busiest mobile PC users are very different than the least-busy mobile users, being uniquely tied to their PCs with instant messaging, streaming music, and maintaining their calendars. “The busiest mobile PC users rely on high-speed internet connections for a very wide range of PC activities, from day-to-day work to having fun,” said Ness. The busiest mobile PCs are not as mobile as might be expected – 43% are used in only one location, 13% are used in two locations, and 44% are used in three or more locations. 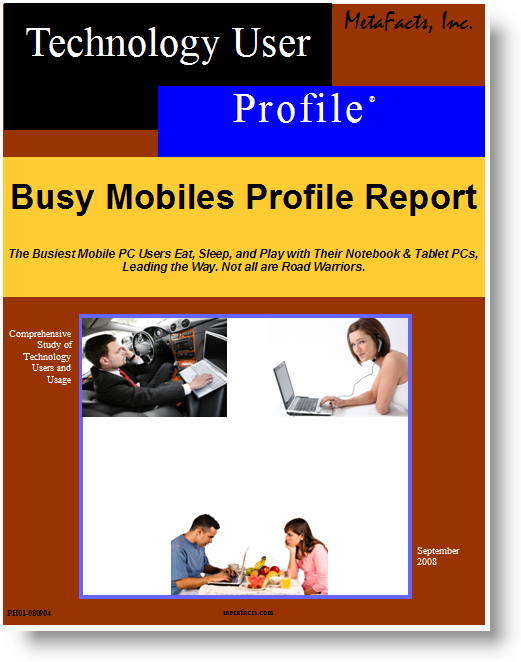 The Busy Mobiles Profile Report is based on surveys with over 10,000 American adults by telephone and online as part of the Technology User Profile 2008 Annual Edition study. At the same time Americans are buying ever-bigger TVs, they are turning their attention to smaller screens – those on their PCs. 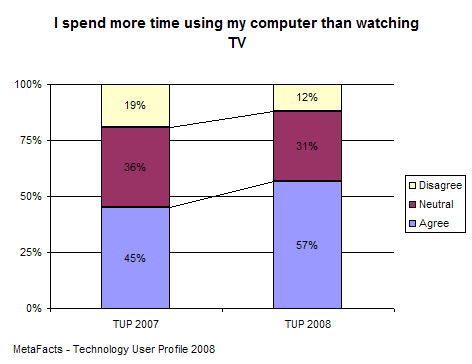 In the 2008 Annual Edition of Technology User Profile, we found that 57% of Home PC Households agree with this statement: “I spend more time using my computer than watching TV.” Only one year ago, this percentage was less than half – 45%. What is the significance of this increasingly defined divide? The draw to the PC away from TV stems from – where else? – Entertainment. Nearly four times as many PC-focused Americans as TV-focused ones say “I keep finding more ways to use the internet for fun,” with 76% of PCers and 20% of TVers in agreement. Also, 89% of PCers surveyed agree: “The Internet is a big part of my home entertainment,” compared with 36% of TVers. Also, hands-on interactivity is a major draw, as the PC-focused go beyond simply pushing a few buttons on their remote controls. PC-focused Americans engage in uniquely proactive, leading-edge, and niche activities more often than TV-focused Americans do. 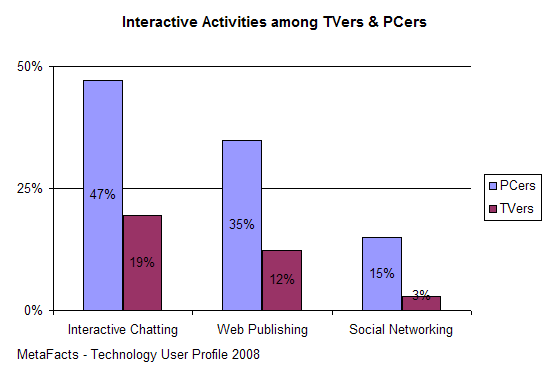 Substantially more PCers participate in interactive chatting (47% PCers, 19% TVers), social networking (35% PCers, 12% TVers), and web publishing (15% PCers, 3% TVers) than do their TV-focused counterparts. Furthermore, PCers use their PCs and the Internet for a wider range of activities, averaging 18 different activities compared with 11 on average among TVers. This reflects a self-reinforcing effect, as people discover more things they can do with their personal computers, the more they weave them into their daily lives, and then they are able to discover yet more activities of interest. Although there are myths that the web is primarily frequented by young millennials, there are no strong demographic differences between those who identify as PC-focused and those who consider themselves TV-focused. These interactivity-seeking PC users are young and old, male and female, and high-income as well as low-income. Looking ahead, we don’t agree with straight-lining pundits who forecast mass migration of eyeballs to the ever-tinier screens of mobile phones and PDAs. Instead, as we’ve watched technology adoption these last 2 decades, we stick with a whole-person view. There are brains and fingers attached to those eyeballs.